You can enroll in a course by viewing the details of the course listing. If you enroll in a course that requires payment, payment is required as part of the enrollment process. 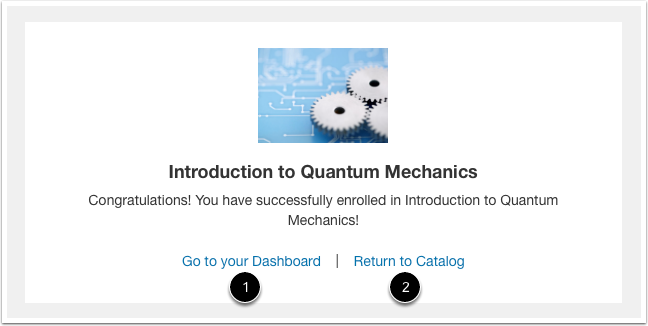 When you have completed your course enrollment, you can view and begin the course in your Catalog Dashboard. If you have never enrolled in a course with your institution, you will need to complete your registration before you can begin the course. Note: Depending how your institution has set up their enrollment process, you may see additional enrollment fields. 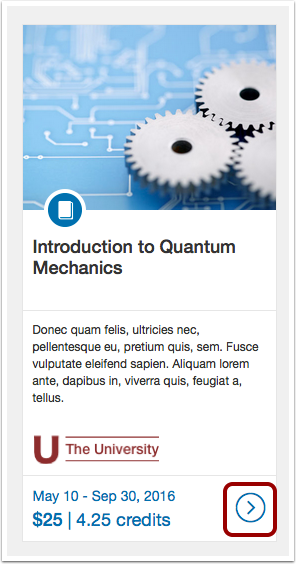 Search for a course in the search field , Categories menu (if available) , or refined search menu . Click the course's arrow icon. If you want to enroll in a course where the enrollment is closed, you may be able to add your name to a wait list and be automatically enrolled if a spot opens. If this feature is available, you can remove yourself from the wait list at any time. Spots can become available if a student drops the course, or if an administrator increases the enrollment limit. Learn more about Catalog wait lists. If you have never enrolled in a catalog course or you are not logged in, enter your full name  and email address . Depending how your institution has set up their enrollment, you may see additional enrollment fields. 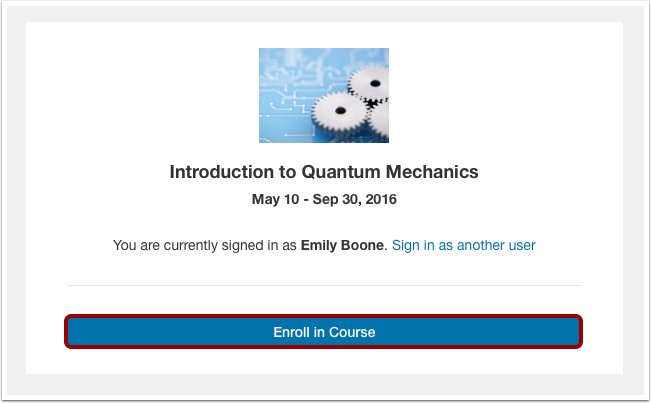 Click the Enroll in Course button . Note: If you already have an account, click the Sign in now link . Otherwise, enter your full name and email address, and catalog will locate your account and prompt you to log in. If you enroll in a course that requires payment, payment information appears at the bottom of the enrollment page. 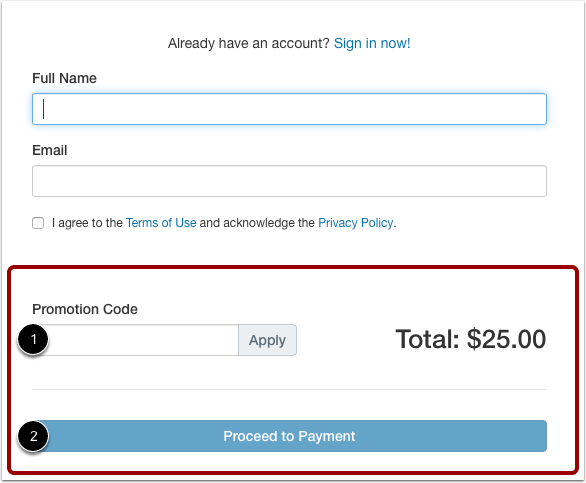 If you have a promotion code, you can enter it in the Promotion Code field . Otherwise, click the Proceed to Payment button . You will be redirected to your institution's payment gateway page. 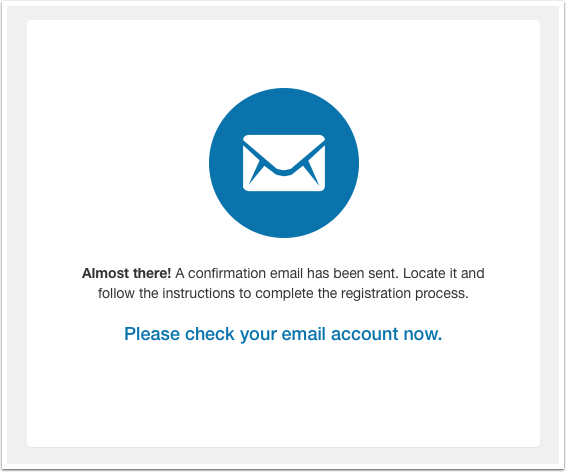 If you do not have a catalog account, catalog will send a confirmation email to the address you entered during registration. You will not be able to begin the course until you have completed your registration. 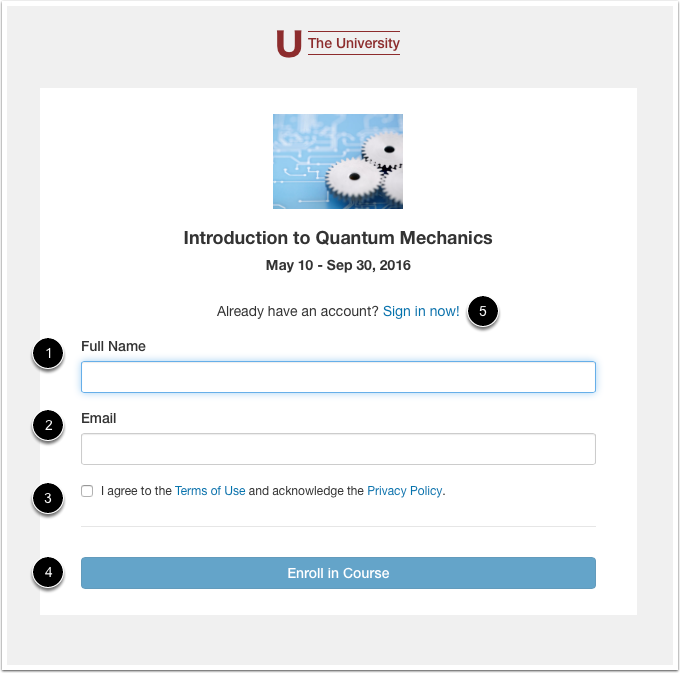 If you are an existing user and you are logged into your account, click the Enroll in Course button. Confirm your enrollment in the course. To go to your Dashboard, click the Go to your Dashboard link . To return to the catalog listings, click the Return to Catalog link . Previous Topic:How do I use my institution's Catalog? Next Topic:How do I enroll in a Catalog program? Table of Contents > All Users > How do I enroll in a Catalog course?